Changes. If there is any one all encompassing word that describes what will make your capital project go over budget this is it. You are investing a lot of money and effort into your project and you want to make sure you get what you planned. 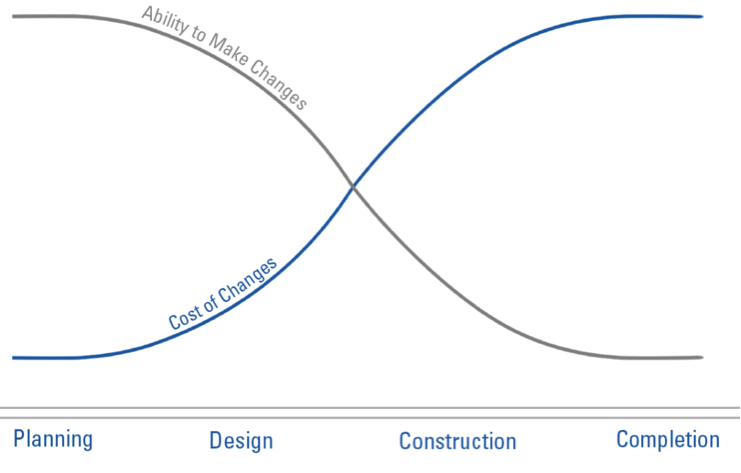 The below chart illustrates the relationship between the Cost of Changes to the design and the ease of ability to make these changes as you move through the phases of your project. During the Planning Phase, design changes can be made easily with very little cost. Moving through the Design Phase, changes will start to cost more and be more challenging to handle due to the numerous consultants required for redesign. Once construction on your projects begin, design changes are more difficult because the Contractor has already agreed on the contract according to the tender documents and specifications. Changes require evaluation, pricing and rescheduling of sub-trades if it affects the schedule. Sometimes these changes result in subcontractor delays or claims. It is evident that should changes need to be made to the design, making them as early as possible will cost less. With the detailed estimates prepared by Quantity Surveyors during planning and design, you’ll be able to make informed decisions on your changes. Is it still within the budget? What you may perceive as a simple change may be just that. But there may be underlying cost factors you know nothing about. You’ve fallen in love with a $10,000 marble fountain for your lobby. But you didn’t think about the additional plumbing that would have to go in, the mechanical pumps that would have to be added to the mechanical room, or the structural reinforcement that would be required to support the 5 tonne fountain. At the early stages of design, that change may end up costing $70,000. Once you’ve started construction, the cost of that change may skyrocket to $300,000. And without a detailed estimate prepared by a Quantity Surveyor, you may not even realize the true cost until the bills start pouring in. Similarly, a Quantity Surveyor’s estimates are imperative in the planning stage. You’ll be able to evaluate options and weigh up the cost impact of any changes being considered. If there is a particular change that is really important to you but the cost exceeds the budget, your Quantity Surveyor can even suggest potential options for reducing costs in other areas which will offset the additional cost of the highly desirable change.